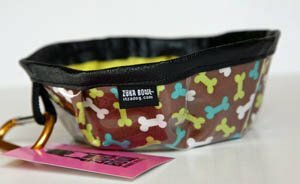 Made in USA dog bowls and they will complement our many other fine dog related items. These bowls are soooo handy. I use mine everywhere--dog park, hiking, camping, running. 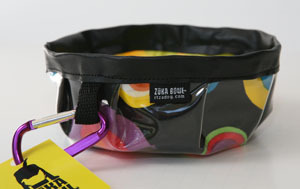 Highly portable--attach to backpack, hydro-pack etc. Does not leak or "sweat" water. Can be used for food as well. PLEASE REMEMBER TO GIVE YOUR DOG WATER FREQUENTLY ESPECIALLY DURING WARMER MONTHS. This Small Bowl holds approximately 16 oz, and features an awesome variety of colors. A classic. Made in Colorado, USA. (Approx 7 inches across). We only the BONES pattern available, but hope to add many more in a month or two. *Carabiner shown in photo is made in China. 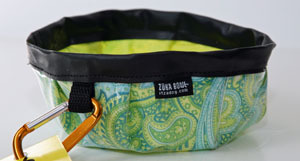 Since we are 100% made in USA, we won't include it UNLESS you check the box with the understanding it's made overseas. Thank you. Note: Made in USA carabiners are difficult to source. I bring this bowl everywhere I go! So convenient. 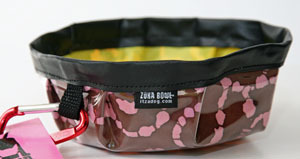 I actually use one of the gear ties from this site and attach the bowl to the handle of my retractable leash. Puppy approved! WP Zogoflex Jive Dog Toy--2.5" 100% made in USA 2 Left!